Ahoy there me landlubbers! You've just spied a great one-stop resource page filled to the brim with themed pirate paper folding and origami projects for you to make and create. X marks the spot right here. My daughter and I just love anything pirate and I'm always looking out for craft projects we can do together. On our travels and adventures, we've found a ton of amazing tutorials that we enjoy and we've shared them here. You'll discover all sorts of gems and treasures including ships, boats, treasure, chests, parrots, weaponry and even a bottle of rum, glug. Have fun me hearties making up all your amazing adventure creations from paper. Keep Plenty of Paper in Stock: Plenty of paper in an assortment of great color choices for all your pirate paper folding projects. The worst thing I have when crafting is not having the actual color of sheet in stock that I really want when I get the urge to fold something. So I always have a great supply in stock. 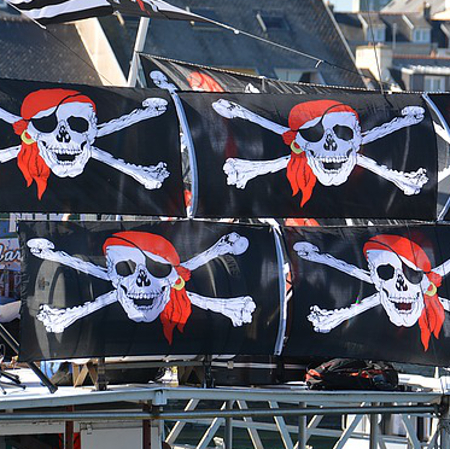 Black, red and white are common color choices for a pirate theme. Make a traditional shaped hat from paper with these great photo instructions. A really easy sailing boat with 2 sails video tutorial. Tutorial to make a rowing boat with no sails - something pirates would use to row to shore. Fold a boat shape from paper with this clear video on YouTube. An easy paper folded boat or ship design just perfect for pirates. Make a Japanese ship that you can add a really great concertina sail to. You wouldn't be much of a Pirate if you weren't interested in sailing on boats and ships, so quit being a landlubber (land lover) and start your adventure with your sailboat of choice. Being Captain of a pirate ship could be a risky business as many famous ships would be captured and taken over by enemy pirates. Common types of ships included the Schooner, Sloop and a Three-Masted Square-Rigger. The larger riggers were not so fast but they could carry vastly more cannons and treasure than the other faster but smaller ships. Fold a parrot for your Pirate with this easy video demonstration. Make your own parrot by using this handy origami bird diagram. A fairly easy flat-folded bottle to which you add a message to the inside of your paper. How to fold an origami ring that you can wear. Claim your treasure or booty now me hearty! An intermediate parrot video tutorial for a parrot who'll balance on your finger. A Pirate would be delighted to turn up a load of jewels on their quest for buried treasure. Why not make these from colored metallic foil paper. Step by step photos to help you makes some amazing jewels. It isn't really a rum bottle but it could be. Here's an amazing three dimensional bottle that you could make from white, silver or light blue paper. Why not stick a label on top to say what's inside. An amazing treasure chest with a lid that opens and closes too. Foil Paper for Treasure and Gems: I love using foil paper because it adds a new and special look to your finished origami creations. Learn to make items using plain paper first before making final and perfect folds using this special shiny foil. It's widely believed that Pirates buried their treasure and precious items and artefacts in difficult to find locations. They would navigate back to the treasure at a later and more convenient date with the aid of a treasure map. Maps are supposed to mark out the supposed location of buried treasure and Pirate secrets. In popular fiction X marks the exact treasure spot on a map or a 'map' will merely give clues or hints as to where the treasure might lie. In history, there are a few cases which relate to real buried treasure - one of which was Spanish gold and silver buried by Sir Francis Drake. Make a small pistol out of 2 dollar bills. A very basic diagram to make a double-barreled pistol out of two pieces of paper. Create a small paper gun with this photo tutorial. Pirates also used Tomahawks too as weapons. Here's how you fold one. Make a basic sword from 2 pieces of paper. Really fun video to fold a pretty good 'pirate' sword. Use the diagram online to make a pirate cannon instead. Pirates used a large variety of weaponry. They would use swords such as a short sword or Cutlass which was useful as a weapon and also could cut through things like rope, wood and canvas which made it very versatile. Pirates also use firearms as well as bladed weaponry: the Flintlock being a popular one. And of course the Cannon was a major piece of artillery equipment which would launch explosives towards other targets such as ships and could cause a great deal of damage in the process. If you're very interested in the detail of pirate weaponry, there is a fab resource on this over at The Pirate King website. Do leave me some comments below if you want to.